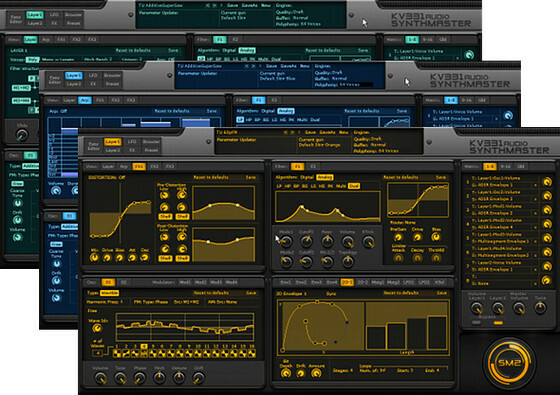 KV331 Audio has updated SynthMaster to version 2.5.4.126 on both Windows and Mac OS X platforms. Added resetting easy parameter settings. Added renaming presets from within the preset browser. Added "Mouse Filter Lag" global parameter, so that mouse movements can be smoothed when editing knobs/etc. Added support for expansion folders, and set the default expansion root path to: <synthmaster data folder>\Expansions. Added support for loading/saving preset banks. Added "MIDI CC Filter Lag" global parameter, so that MIDI CC smoothing can be controlled globally. For list-boxes, auto-scroll behavior is now made optional, controllable from the configuration file. 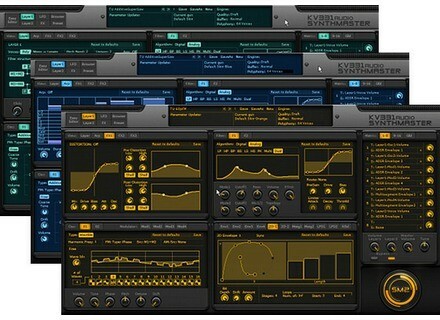 SynthMaster doesn't load some scl (scale) files correctly. When stop is pressed from the host DAW, hanging notes might occur for some host DAWs. Editing Easy1 with mouse doesn't change the parameter value (mouse wheel works though). Saving a presets resets presets list to the beginning of the list. Selecting first entry of a drop-down and then selecting another entry reselects the 2nd entry of the drop-down in some cases. Filter cut-off doesn't follow pitch bends when key follow is on. When saving presets as bank for the 2nd time, SynthMaster crashes. Portamento time shortens when quality is set to good/better/best. Blue Skin colors were not correct for some user interface elements. Global Scale drop-down control was not working correctly.